Cupping has been used since 3000 BCE, it originated in ancient Egypt where it was used to remove toxins from the body . Since then cupping has spread throughout the world and been used in many cultures as a treatment for a variety diseases. Today cupping is mostly seen in traditional eastern medicine, where it is used to correct blockages and help the flow of Qi throughout the body . It involves suctioning special cups to the skin of a patient, in the form of wet cupping or dry cupping. Wet Cupping is invasive and involves suctioning small amounts of blood through minor incisions made in the skin, this means it is usually not performed by physiotherapists in western practices . Dry cupping is non-invasive, as it doesn’t involve exposure to blood. It is mostly used to treat musculoskeletal pain in the chest, stomach, back and buttocks . Smaller cups can also be used to treat regions on the arms and legs. Cups vary from 38-50mm in diameter and are generally made of plastic or glass . The cup is suctioned and held in place by heating the air in the cup then placing the rim of the cup on the skin so it is air tight, or by suctioning air out of the cup using an air pump after placing it on the skin . This negative pressure inside the cup suctions the skin and feels like your skin and soft tissue underneath is being pulled or stretched. Then it is generally left in place for 5-20 minutes or can be moved around to cover a larger area using lubricant so that it can slide without interrupting the vacuum seal made between the skin and the cup . How does dry cupping work? The vacuum inside the cup creates a tensile force that stretches the skin, subcutaneous tissue and fascia lying beneath . This also causes the small blood vessels in that area to expand. The larger the cup and more suction created the stronger it stretches the soft body tissues underneath, and the longer it is left in place the more blood that is drawn to that area . Yes, provided it is performed by a suitably trained therapist. Patients may feel warmer and may sweat during a cupping treatment, this is just a result of blood vessels expanding and drawing more blood and heat to the skin . Patients may also experience redness, swelling and bruising of areas of skin that have been cupped after a treatment, this is normal and should go away within a few days or weeks . You should not having cupping therapy if you are pregnant, menstruating, have metastatic cancer or have cupping therapy over an area with a bone fracture, deep vein thrombosis, palpable pulse or skin irritation . Complications to cupping are very rare and usually due to a lack of therapist training and incorrect practice, which have lead to only a few reports of skin burns, contamination and pressure wounds . What does research say about the effectiveness of dry cupping? There is however a need for future studies to focus on confirming comparing these effects to standard treatments as well as understanding long lasting effects of dry cupping. If you have any questions regarding treating your aches and pains or cupping therapy, please give us a call at (02) 8411 2050. At Thornleigh Performance Physiotherapy, we can give you an accurate diagnosis and treatment, to help you get back in action as soon as possible. We are conveniently located near Beecroft, Cherrybrook, Hornsby, Normanhurst, Pennant Hills, Waitara, Wahroonga, Westleigh, West Pennant Hills, and West Pymble. Nickel, J.C., Management of urinary tract infections: historical perspective and current strategies: part 1—before antibiotics. The Journal of urology, 2005. 173(1): p. 21-26. Tham, L., H. Lee, and C. Lu, Cupping: from a biomechanical perspective. Journal of biomechanics, 2006. 39(12): p. 2183-2193. Rozenfeld, E. and L. Kalichman, New is the well-forgotten old: The use of dry cupping in musculoskeletal medicine. Journal of bodywork and movement therapies, 2016. 20(1): p. 173-178. Yoo, S.S. and F. Tausk, Cupping: east meets west. International journal of dermatology, 2004. 43(9): p. 664-665. Turk, J. and E. Allen, Bleeding and cupping. Annals of the Royal College of Surgeons of England, 1983. 65(2): p. 128. Ahmadi, A., D.C. Schwebel, and M. Rezaei, The efficacy of wet-cupping in the treatment of tension and migraine headache. The American journal of Chinese medicine, 2008. 36(01): p. 37-44. Musial, F., D. Spohn, and R. Rolke, Naturopathic reflex therapies for the treatment of chronic back and neck pain-part 1: neurobiological foundations. Complementary Medicine Research, 2013. 20(3): p. 219-224. Chirali, I.Z., Traditional Chinese medicine: cupping therapy. 1999: Elsevier Health Sciences. Cao, H., X. Li, and J. Liu, An updated review of the efficacy of cupping therapy. PloS one, 2012. 7(2): p. e31793. Lauche, R., et al., The influence of a series of five dry cupping treatments on pain and mechanical thresholds in patients with chronic non-specific neck pain-a randomised controlled pilot study. BMC complementary and alternative medicine, 2011. 11(1): p. 63. Cramer, H., et al., Randomized controlled trial of pulsating cupping (pneumatic pulsation therapy) for chronic neck pain. Complementary Medicine Research, 2011. 18(6): p. 327-334. Kim, T.-H., et al., Cupping for treating neck pain in video display terminal (VDT) users: a randomized controlled pilot trial. Journal of occupational health, 2012. 54(6): p. 416-426. Markowski, A., et al., A pilot study analyzing the effects of Chinese cupping as an adjunct treatment for patients with subacute low back pain on relieving pain, improving range of motion, and improving function. The Journal of Alternative and Complementary Medicine, 2014. 20(2): p. 113-117. Teut, M., et al., Pulsatile dry cupping in patients with osteoarthritis of the knee–a randomized controlled exploratory trial. BMC complementary and alternative medicine, 2012. 12(1): p. 184. Don’t run from the P.O.L.I.C.E. So, you rolled your ankle, you're thinking it will be fine, I’ll just walk it off. Little did you know as you continued to play the last 10 minutes of the game, the phases of healing have already begun. As you continue to run, your ankle throbs and feels unstable beneath your body. You feel sick as the pain won’t go away but continues to get worse. Thoughts race through your mind, what have I done? Should I see someone? Finally, you make the decision to come off the court, but what do you do now? P – Protection: this reminds individuals that a little bit of pain is okay but if the injury causes severe pain then the ankle should be protected using bandages, taping or crutches to off-load the ankle. O – Optimal: the right amount of pain/discomfort (not too much but tolerable). L – Loading: placing weight on the ankle (optimal-loading is advised). I – Ice*: applied for 8-10 minutes at a time [2,3] alternating between 10 minutes on then 10 minutes off. This should be done as often as possible in the first 48 hours. C – Compression: apply a compression bandage around the ankle, ensuring it is firm enough without cutting off circulation to the foot (Pinch test: squeeze toe, it should turn white then red again). E – Elevation: raise leg above heart height to prevent pool of blood around the ankle due to gravity. * Warning: any burning sensations in the region REMOVE the ice. Do not place ice directly on skin (apply a 1-2 cm cloth in between ice and skin). Never place ankle on top of the ice but rather the ice on top of the ankle. Recent studies have shown that protecting the joint should be only as required as resting or offloading the joint could be detrimental causing changes as to how the tissue recovers [1, 4, 5]. These studies therefore promote optimal loading, where an individual can start placing body weight onto the ankle, as tolerable. This encourages correct fiber type and alignment to develop, early mobilisation and can facilitate accelerated recovery times [1, 4]. Further benefits of optimal loading are positive as changes to mechanical properties regarding load alter sensory feedback. This informs the brain that this painful feedback, which it was experiencing earlier on, is no long dangerous thus de-sensitizing the injury and reducing pain levels . Previously the R.I.C.E. method did not consider optimal loading and referral but rather focused on resting and went straight into management. Though icing is effective, studies have shown this has a limited effect depending on the duration and severity of the injury and should only be utilised in the acute phases . Benefits of using ice should still be utilised as icing reduces the analgesic (pain) response and facilitates optimal healing by reducing swelling that would otherwise delay an individual’s rehabilitation process [7, 8]. So, when in doubt, don’t run, follow the P.O.L.I.C.E. protocol. If pain persists or worsens or you are unable to weight bare, contact your local physiotherapist and book an appointment. What would a Physiotherapist do to help? Perform a thorough movement examination of the lower body to provide education and understanding of the condition. Provide tailored strategies and modifications to correct improper biomechanics of the ankle, i.e., taping, ergonomic assessment. Design a personalised exercise program tailored to resolving muscle imbalances that would otherwise cause ankle instability. Assist with improving range of movement and pain management strategies. Provide education on self-management techniques. Improve balance and retrain an individual back to pre-injury status. If you have any questions regarding your acute injury, please give us a call at (02) 8411 2050. At Thornleigh Performance Physiotherapy, we can give you an accurate diagnosis and treatment, to help you get back in action as soon as possible. We are conveniently located near Beecroft, Cherrybrook, Hornsby, Normanhurst, Pennant Hills, Waitara, Wahroonga, Westleigh, West Pennant Hills, and West Pymble. Bleakley CM, Glasgow P, MacAuley DC. PRICE needs updating, should we call the POLICE?. British Journal of Sports Medicine. 2011 Sep 7:bjsports-2011. Adie, Naylor, & Harris. (2010). Cryotherapy After Total Knee Arthroplasty: A Systematic Review and Meta-Analysis of Randomized Controlled Trials. The Journal of Arthroplasty,25(5), 709-715. Prins, J., Stubbe, J., Van Meeteren, N., Scheffers, F., & Van Dongen, M. (2011). Feasibility and preliminary effectiveness of ice therapy in patients with an acute tear in the gastrocnemius muscle: A pilot randomized controlled trial. Clinical Rehabilitation, 25(5), 433-41. Glasgow, P., Phillips, N., & Bleakley, C. (2015). Optimal loading: Key variables and mechanisms. British Journal of Sports Medicine, 49(5), 278-279. Bleakley, C., Dischiavi, S., Taylor, J., Doherty, C., & Delahunt, E. (2017). Rehabilitation reduces re-injury risk post ankle sprain, but there is no consensus on optimal exercise dose or content: A systematic review and meta-analysis. British Journal of Sports Medicine, 51(20), British Journal of Sports Medicine, Oct 15, 2017, Vol.51(20). Hing, Wayne, Lopes, Justin, Hume, Patria A., & Reid, Duncan A. (2011). Comparison of multimodal physiotherapy and "R.I.C.E." self-treatment for early management of ankle sprains. (RESEARCH REPORT)(Report). New Zealand Journal of Physiotherapy, 39(1), 13-19. MacAuley, D. (2010). Effect of accelerated rehabilitation on function after ankle sprain: Randomised controlled trial. BMJ. British Medical Journal (Clinical Research Ed. ), 340(10), 1122. Bleakley CM, O'Connor SR, Tully MA, et al. Effect of accelerated rehabilitation on function after ankle sprain: randomised controlled trial. BMJ. 2010; 340:1964. Patellofemoral pain syndrome (PFPS) is prevalent in approximately 25% of the athletic population and most commonly affects young adult females . PFPS is characterised by anterior knee pain in and around the patella [2,3]. When bending at the knee joint, the patella should normally track in a lateral to medial direction before moving laterally again at full knee flexion. This motion is controlled by the quadriceps muscle group, particularly the vastus medialis oblique and vastus lateralis components. Poor coordination or weakness of these muscles can lead to inflammation of soft tissues (lateral retinaculum, infrapatellar synovium and fat pad) in addition to stress on cartilage and bone causing pain . May predispose to the development of patellofemoral osteoarthritis. If you have any questions regarding your knee pain, please give us a call at (02) 8411 2050. At Thornleigh Performance Physiotherapy, we can give you an accurate diagnosis and treatment, to help you get back in action as soon as possible. We are conveniently located near Beecroft, Cherrybrook, Hornsby, Normanhurst, Pennant Hills, Waitara, Wahroonga, Westleigh, West Pennant Hills, and West Pymble. Nunes, G. S., Stapait, E. L., Kirsten, M. H., De Noronha, M., & Santos, G. M. (2013). Clinical test for diagnosis of patellofemoral pain syndrome: Systematic review with meta-analysis. Physical Therapy in Sport, 14(1), 54-59. Brukner, P. (2012). Brukner & Khan's clinical sports medicine. North Ryde: McGraw-Hill. 4th Edition, 87. 725-726. Panken, A., Heymans, M., Van Oort, L., & Verhagen, A. (2015). Clinical prognostic factors for atients with aterior knee pain in physical therapy: A systematic review. International journal of sports physical therapy, 10(7), 929. Collado, H., & Fredericson, M. (2010). Patellofemoral pain syndrome. Clinics in sports medicine, 29(3), 379-398. Collins, N. J., Bisset, L. M., Crossley, K. M., & Vicenzino, B. (2012). Efficacy of nonsurgical interventions for anterior knee pain. Sports medicine, 42(1), 31-49. The shoulder contains numerous structures (muscle, bone, ligaments, tendons and bursae) that work closely together to allow optimum functioning. 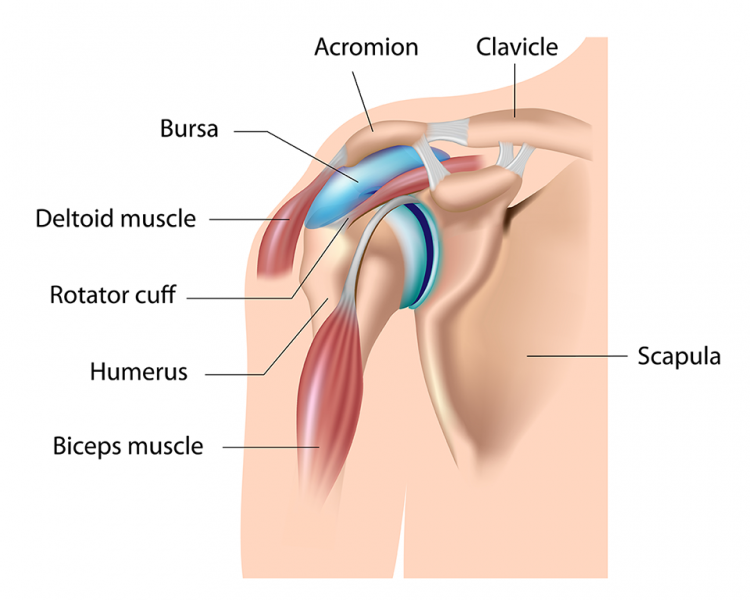 Within each shoulder is two purse-like sacs that contain fluid: the sub-acromial and sub-deltoid bursae. These both help to reduce friction over adjacent surfaces (i.e. muscle on muscle, bone to muscle) . When irritated, this leads to a thickening of the bursa causing a painful condition known as bursitis . This is considered an active warning sign that the surrounding structures have undergone repeated trauma from overuse or have been involved in a single incident (i.e. collision) [1, 2, 3]. Poor body mechanics can also be a contributing factor to the onset of bursitis . It has been commonly associated with chronic shoulder pain, rotator cuff tears and degenerative tendinitis of the rotator cuff . Is a rare condition in which the bursa becomes infected. Sepsis is caused in the bursa because of direct contact piercing through the skin in the form of isotretinoin therapy and corticosteroid injections . Individuals will feel the same symptoms as listed above, however, they may also become feverish, tired and sick. The shoulder may appear red and radiate heat [2, 4, 5]. Treatment should be sought from a medical practitioner to provide antibiotics to prevent the spread of the infection [2, 4, 5]. Perform a thorough postural and movement examination of the upper body to provide education and understanding into condition. Provide tailored strategies and modifications to correct improper biomechanics of the shoulder, i.e. taping, ergonomic assessment. Design a personalised exercise program tailored to resolving muscle imbalances that would otherwise cause shoulder bursitis. Assist with improving range and pain management strategies. If you have any questions regarding your shoulder pain, please give us a call at (02) 8411 2050. At Thornleigh Performance Physiotherapy, we can give you an accurate diagnosis and treatment, to help you get back in action as soon as possible. We are conveniently located near Beecroft, Cherrybrook, Hornsby, Normanhurst, Pennant Hills, Waitara, Wahroonga, Westleigh, West Pennant Hills, and West Pymble. Santavirta, S., Konttinen, Y., Antti-Poika, T., & Nordström, I. (1992). Inflammation of the subacromial bursa in chronic shoulder pain. Archives of Orthopaedic and Trauma Surgery,111(6), 336-340. Drezner, J., & Sennett, B. (2004). Subacromial/subdeltoid septic bursitis associated with isotretinoin therapy and corticosteroid injection. The Journal of the American Board of Family Practice, 17(4), 299-302. Do you often feel more pain during times of increased stress? Pain is regulated by inputs from the brain, spinal cord and the environment and is influenced by multiple factors such as mood, thoughts, activity, sleep and stress . These factors can influence the severity of pain and affect your prognosis. Often when the pressures of family, work and everyday life are weighing on you, not only do you experience an emotional impact but this can also increase your pain intensity and duration. Additionally, experiencing physical pain also makes people feel more stressed, thus creating a vicious cycle that may even lead to chronic injury. Therefore, managing stress is a significant factor to reduce pain and improve quality of life [1,2]. Psychological factors can contribute to increases in muscular tension and postural abnormalities that can accentuate the severity of physical injuries. These changes in muscle and posture can prevent muscles from functioning appropriately resulting in increased pain [1, 3]. For example, in patients following neck injuries, especially if the mechanism of injury was traumatic, they may experience increased muscle tension in the head, neck or upper limbs in addition to adapting abnormal postures that can heighten physical findings in the neck. The body’s response to stress and pain also varies widely among individuals, and these psychological factors could drive pain and take longer to resolve. Due to this variability, it is important to identify factors that may influence a patient’s recovery to potentially prevent re-occurrence . People suffering from psychological distress were shown to be five times more likely to suffer from chronic pain . Current evidence supports the use of pain education for chronic musculoskeletal disorders in reducing pain, improving function, encouraging movement, lowering disability, and minimizing healthcare utilisation . Research also demonstrated the effects of participating in regular exercise as an effective strategy for managing stress. Studies showed that post-exercise there was a significant impact on blood pressure responses to stress that may have implications for cardiovascular health [6,7]. Studies also recommended relaxation techniques such as deep breathing, yoga or meditation. These techniques encourage abdominal breathing which has been shown to promote stress reduction . Overall, multidisciplinary biopsychosocial rehabilitation programs are recommended especially to those who suffer from chronic pain. These programs typically included pain education, pacing physical activities, and psychological treatment to address mood problems, sleep disturbances, unhelpful thoughts and behaviours in addition to medical management . If you have any questions regarding whether we can help you manage your stress and pain better, please give us a call at (02) 8411 2050. At Thornleigh Performance Physiotherapy, we can give you an accurate diagnosis and treatment, to help you get back in action as soon as possible. We are conveniently located near Beecroft, Cherrybrook, Hornsby, Normanhurst, Pennant Hills, Waitara, Wahroonga, Westleigh, West Pennant Hills, and West Pymble. Brukner, P. (2012). Brukner & Khan's clinical sports medicine. North Ryde: McGraw-Hill.41-52, 332-333. Kamper, S. J., Apeldoorn, A. T., Chiarotto, A., Smeets, R. J. E. M., Ostelo, R. W. J. G., Guzman, J., & van Tulder, M. W. (2015). Multidisciplinary biopsychosocial rehabilitation for chronic low back pain: Cochrane systematic review and meta-analysis. Bmj, 350, h444. Berger, B. G., & Owen, D. R. (1988). Stress reduction and mood enhancement in four exercise modes: Swimming, body conditioning, hatha yoga, and fencing. Research quarterly for exercise and sport, 59(2), 148-159. ABo, S. (2007). National survey of mental health and wellbeing 2007 (Cat. no. 4326.0). Canberra2007. Louw, A., Zimney, K., Puentedura, E. J., & Diener, I. (2016). The efficacy of pain neuroscience education on musculoskeletal pain: A systematic review of the literature. Physiotherapy theory and practice, 32(5), 332-355. Hamer, M., Taylor, A., & Steptoe, A. (2006). The effect of acute aerobic exercise on stress related blood pressure responses: a systematic review and meta-analysis. Biological psychology, 71(2), 183-190. What is medial tibial stress syndrome? Medial tibial stress syndrome (MTSS) is a common condition mostly affecting runners and recreational sports players. It is an overuse injury resulting from repetitive stress to the bone in the lower leg, the tibia. Stress reactions occur on the tibia and the surrounding muscles when the body is unable to heal properly, and with repetitive stress and inadequate healing, this creates an overuse condition. Tibialis posterior, a muscle in the back of the calf has been the main muscle responsible for this condition. However recent studies have identified that several muscles are involved, including flexor digitorum longus and the soleus, which are two muscles in the calf as well. The foundation of treatment for medial tibial stress syndrome is based on identifying the risk factors involved, and treating the underlying pathology. This will ensure that we are treating the cause of the problem so it will not return in the future. Treatment begins with providing relief through rest and ice. In order to keep you active and still exercising you are able to completed pain free activities such as swimming or cycling. Your physiotherapist will then begin a careful assessment of how your foot, knee and hip alignment are affecting your running and walking. Taping may be used to control your foot pronation (flat foot), and other techniques including strengthening and stretching of muscle imbalances, mobility exercises, motor control and stability exercises. Your physiotherapist will tailor these treatment options to your specific biomechanics which will reduce the stress placed on the tibia. If you have any questions regarding shin pain, please give us a call at (02) 8411 2050. At Thornleigh Performance Physiotherapy, we can give you an accurate diagnosis and treatment, to help you get back in action as soon as possible. We are conveniently located near Beecroft, Cherrybrook, Hornsby, Normanhurst, Pennant Hills, Waitara, Wahroonga, Westleigh, West Pennant Hills, and West Pymble. Galbraith, M. Lavallee, M. 2009. Medial tibial Stress syndrome: conservative treatment options. Current Rev in Musculo Med. 2(3) 127-133. Batt, M. 2011. Medial Tibial Stress Syndrome. British Journal of Sports Medicine. 45(2)1-8. Franklyn, M. Oakes, B. 2015. Aetiology and mechanisms of injury in medial tibial stress syndrome: current and future development. World J of Ortho. 6(8) 577-589. Gua sha is commonly known to be a traditional eastern medicine technique where a blunt tool, such as a ceramic soup spoon, is used to scrape the skin to improve blood circulation and oxygen supply to the soft tissue. A modern take on this technique is often referred to as instrument-assisted soft tissue mobilisation (IASTM). What happens during tissue injury? Inflammation usually occurs following an injury to generate new cells. The formation of scar tissue reduces elasticity of the injured tissue and results in adhesion. The scar tissue may also limit oxygen and nutrient supply and thus affect tissue regeneration. If left untreated, chronic inflammation may lead to tissue degeneration and contribute to chronic pain. These areas may also be more susceptible to re-injury. How does gua sha work for injured tissue? Adequate pressure and shear force applied during soft tissue mobilisation create micro-trauma in the affected area. This can facilitate the inflammatory response during the healing phase of the tissue. By using an instrument to assist, the clinician is able to deliver a greater force and stimulate adhesive points deeper within the tissue. Removing scar tissue and releasing adhesions help collagen synthesis and realignment. These in turn improve soft tissue function, range of motion, decrease pain and speed up healing. Do I need gua sha? What should I expect when receiving gua sha? The clinician will typically start by rubbing lubricant such as cream to the skin before applying the instrument at a tolerable pressure onto the affected area. The clinician will perform smooth firm strokes over the affected area while feeling for restrictions or soft tissue irregularities. This process may take about 5-15 minutes depending on the affected area and condition. In physiotherapy, gua sha may be used in conjunction with stretching and strengthening exercises depending on the type of injury and the stage of recovery. These exercises help restoration of function and prevent re-injury. Are there any side effects with gua sha ? Gua sha should not be painful during treatment. The rubbing and scraping may cause small blood capillaries near the surface of the skin to burst and result in redness, light bruising or soreness. These symptoms should resolve in a few days and can be managed with ice if necessary. If you have any questions regarding whether gua sha can help, please give us a call at (02) 8411 2050. At Thornleigh Performance Physiotherapy, we can give you an accurate diagnosis and treatment, to help you get back in action as soon as possible. We are conveniently located near Beecroft, Cherrybrook, Hornsby, Normanhurst, Pennant Hills, Waitara, Wahroonga, Westleigh, West Pennant Hills, and West Pymble. Kim J, Sung DJ, Lee J. Therapeutic effectiveness of instrument-assisted soft tissue mobilization for soft tissue injury: mechanisms and practical application. J Exerc Rehabil. 2017;13(1):12-22. Lambert M, Hitchcock R, Lavallee K, et al. The effects of instrument-assisted soft tissue mobilization compared to other interventions on pain and function: a systematic review. Physical Therapy Reviews. 2017;22(1-2):76-85. A 53 year old female presented with gradual onset of pain to her right elbow localised to the lateral side of elbow and forearm. She described her pain to worsen with gripping, reaching and lifting tasks, especially when attempting to use scissors at work. What can physiotherapy do to help? At rest, with her forearm relaxed on a pillow the patient had minimal to no symptoms. During active and passive range of motion examinations, pronation (inward rotation) of her forearm with the elbow extended and flexion of the wrist were the most provocative movements. Resisted extension of her wrist and 3rd finger also reproduced her symptoms and she was tender upon palpation over the lateral side of her right elbow and presented with painful and decreased grip strength. No reproduction of symptoms was evident following a screen of her right shoulder and neck, indicating a non-referral pain diagnosis. Her mechanism of injury and clinical presentation indicate an extensor tendinopathy or commonly known as “tennis elbow”. A multimodal treatment incorporating education, unloading of the tendon from aggravating factors, pain relief and restoring tissue capacity and control was used to manage her extensor tendinopathy appropriately. Pulsed ultrasound was firstly used to promote the initial healing of soft tissue. She had active trigger point pain along her forearm muscle, that is a common occurrence in the presentation of extensor tendinopathy. The patient responded well with dry needling to her right forearm muscles which assisted in relieving muscle tension and forearm pain. She was provided with education regarding the use of ice as a form of pain management and unloading strategies. Isometric muscle activation exercises and stretches were also prescribed to be completed at home. She was also provided with a counterforce brace to be worn during working hours to assist her in gripping with reduced pain. Over the next couple of weeks, the main focus was to restore the tissues capacity to withstand loads with minimal to no pain. This is achieved through appropriate rest and unloading of the tendon. Completing a progressive home strengthening exercise program with appropriate loads and tendon stretching. These strategies allowed time for the patient’s tendon to heal appropriately and reduce the symptoms the patient was experiencing. Manual therapy techniques and dry needling were used in conjunction to relieve any associated muscle tension. Following a couple weeks, she was able to return to full work duties with minimal to no issues. If you have any questions regarding elbow pain, and need an assessment, please give us a call at (02) 8411 2050. Here at Thornleigh Performance Physiotherapy, we can give you an accurate diagnosis and treatment, to help you get back in action as soon as possible. We are conveniently located near Beecroft, Cherrybrook, Hornsby, Normanhurst, Pennant Hills, Waitara, Wahroonga, Westleigh, West Pennant Hills, and West Pymble. What does your pillow do to you? With approximately one third of our lives spent sleeping, it is essential to have good quality sleep in order for the body to maintain normal physiological function and biological processes [1,2]. However for many of us, a good night’s rest is interrupted by uncomfortable neck pains that most likely will wake us during the night and persist throughout the day. Studies have shown that problems sleeping and in sufficient time of rest can also be indirectly linked with increased risk of diseases, hormonal changes, sleeping disorders and associated stress . So you may ask, what can be done to ensure you get a more comfortable nights’ rest and reduced neck pain? Studies have concluded that the proper selection of pillow can significantly reduce neck muscular tension and pain, improving an individual’s overall quality of sleep . Poor neck support increases the work of neck and upper back muscles during sleep, causing increased biomechanical stress and morning pain . Therefore the posture we adopt during a night’s rest can be related to musculoskeletal injuries of the neck and upper back, with muscular tension found to be a contributing factor to constant headaches . Muscular tension and neck pain can therefore benefit from an appropriate pillow type as an adjunct management strategy to neck exercise training [1,4]. There are many various pillows on the market designed to help create the most relaxed position for the neck joints and surrounding muscles. How do you know what pillow to choose? A one size fits all approach does not exist. Another study found that muscle activity was higher in those with shoulder and neck pain, with a change of pillow height to a more suitable height significantly lowering the amount of muscle activity . This study also showed that a pillow height of 10 cm not only had the lowest muscle activity but also resulted in similar muscle activity on both side when in side lying positions. They concluded that the best perception of comfort was associated with better head and shoulder alignment which produced the lowest amount of muscular activation . A study that compared the comfort of certain material types of pillows found that memory foam pillows performed best with reduced waking pain and improved sleep quality, whilst the feather pillow performed the worst . However, changing a pillow may be beneficial in improving a night rest and reduce pain, but for those who experience acute and chronic neck pain clinical treatment is most advantageous in conjunction with a suitable pillow. Provide education to encourage self-management strategies. If you have any questions regarding neck pain and sleeping posture please give us a call at (02) 8411 2050. Here at Thornleigh Performance Physiotherapy, we can give you an accurate diagnosis and treatment, to help you get back in action as soon as possible. We are conveniently located near Beecroft, Cherrybrook, Hornsby, Normanhurst, Pennant Hills, Waitara, Wahroonga, Westleigh, West Pennant Hills, and West Pymble. Erfania P, Tenzif S, Guerriero RC. Assessing effects of a semi-customized experimental cervical pillow on symptomatic adults with chronic neck pain with and without headache. Journal of the Canadian Chiropractic Association. 2004;48(1):20-28. Sacco ICN, Pereira ILR, Dinato RC, Silva VC, Friso B, Viterbo SF. The effect of pillow height on muscle activity of the neck and mid-upper back and patient perception of comfort. Journal Of Manipulative And Physiological Therapeutics. 2015;38(6):375-381. Lavin RA, Pappagallo M, Kuhlemeier KV. Cervical pain: A comparison of three pillows. Archives of Physical Medicine and Rehabilitation. 1997;78(2):193-198. Helewa A, Goldsmith CH, Smythe HA, Lee P, Obright K, Stitt L. Effect of therapeutic exercise and sleeping neck support on patients with chronic neck pain: a randomized clinical trial. The Journal of Rheumatology. 2007;34(1):151-158. Persson L, Moritz U. Neck support pillows: a comparative study. Journal Of Manipulative And Physiological Therapeutics. 1998;21(4):237-240. Gordon SJ, Grimmer-Somers K, Trott P. Pillow use: The behaviour of cervical pain, sleep quality and pillow comfort in side sleepers. Manual Therapy. 2009;14(6):671-678. Osteoarthritis (OA) is a complex degenerative non-inflammatory joint disease that affects the whole joint including subchondral bone, articular cartilage, ligaments and muscles that surround a synovial joint1 . It is characterised by progressive cartilage loss, subchondral bone remodelling and formation of osteophytes narrowing the joint space . Low-grade local synovial inflammation occurs believed to be a result of release of inflammatory mediators from the degradation of articular cartilage . OA is the most common type of arthritis that leads to a gradual decline in health, physical function and well-being if not managed correctly . Hands, hips, lower back, knees and feet are the areas that are most affected by OA. OA is commonly referred as a “wear and tear” form of arthritis as it is thought to occur as a part of an aging process, however it has been found that aging is not a predictor of OA . The aetiology of OA is however due to the result of excessive mechanical stress applied in context of susceptibility modifiable and non-modifiable factors such as age, genetics, gender, ethnicity, local mechanical factors, obesity and joint injury . OA is a highly preventable and manageable disease, with 70 per cent of cases within Australia preventable by avoiding excess weight gain and joint injuries . OA currently affects one in 12 Australians and is the leading cause of chronic pain and disability world-wide [1,4]. Although the incidence of OA has been found to increase with age, osteoarthritis can occur at any stage, with more than half of the people being of working age [1 ]. It is estimated that within the next four years, the prevalence of OA will have doubled due to the higher rates of obesity also placing people at a higher risk of death compared to a general population . The causes of OA are not well understood however it has been shown that several biomechanical, genetic, behavioural and environmental factors contribute . Gender: Higher prevalence in women, incidence rates increases around menopause. Education on pain and self-management. Studies has found that the benefits of exercise in OA in relation to pain and physical function has a similar effect to that gained by analgesic and non-steroidal anti-inflammatory medications with fewer side effects  Physiotherapy treatment and management will be tailored to target each individual taking into account specific risk factors and patient characteristics. If you have any questions regarding managing OA better, please give us a call at (02) 8411 2050. At Thornleigh Performance Physiotherapy, we can give you an accurate diagnosis and treatment, to help you get back in action as soon as possible. We are conveniently located near Beecroft, Cherrybrook, Hornsby, Normanhurst, Pennant Hills, Waitara, Wahroonga, Westleigh, West Pennant Hills, and West Pymble. Arthritis A. Time to Move: Osteoarthrtis. http://www.arthritisaustralia.com.au/index.php/reports/time-to-move-arthritis-reports.html: Arthritis Australia;March 2014. Hunter DJ. Osteoarthritis. Best Practice & Research Clinical Rheumatology. 2011;25(6):801-814. Berenbaum F. Osteoarthritis as an inflammatory disease (osteoarthritis is not osteoarthrosis!). Osteoarthritis and Cartilage. 2013;21(1):16-21. Larmer PJ, Reay ND, Aubert ER, Kersten P. Systematic review of guidelines for the physical management of osteoarthritis. Archives of physical medicine and rehabilitation. 2014;95(2):375-389. Palazzo C, Nguyen C, Lefevre-Colau M-M, Rannou F, Poiraudeau S. Risk factors and burden of osteoarthritis. Annals of Physical and Rehabilitation Medicine. 2016;59(3):134-138. Michael JW-P, Schlüter-Brust KU, Eysel P. The epidemiology, etiology, diagnosis, and treatment of osteoarthritis of the knee. Deutsches Arzteblatt International. 2010;107(9):152. Rosedale R, Rastogi R, May S, et al. Efficacy of exercise intervention as determined by the McKenzie System of Mechanical Diagnosis and Therapy for knee osteoarthritis: a randomized controlled trial. journal of orthopaedic & sports physical therapy. 2014;44(3):173-A176. A 50 years old female, Mrs L., presents with middle back pain and left arm pain gradually developed over the weekend without clear mechanism of injury. The only potential reason that she could think of was gardening. She had ongoing back stiffness; otherwise she is normally healthy and active. What could be the cause of her problem? Mrs L’s left arm pain is provoked when she is reaching forward. Her left shoulder range of movement is normal. She has reduced neck and middle back range of movement, specifically cervical retraction and thoracic extension. In neurological examination, Mrs L’s biceps and triceps jerk reflex are normal. Her strength and sensation were also normal. On palpation, her left mid thoracic area is stiff and her arm pain is also provoked. It appears that Mrs L’s left arm symptom is related to her left thoracic spine. Mrs L’s left arm symptoms and thoracic spine stiffness are reduced after some thoracic spine joint mobilisation. She was then given some cervical and thoracic mobility exercises to restore her loss of range of movement. Her symptom is almost completely abolished in two weeks. It is not uncommon that sometimes the arm pain that patient experienced come from a different body part, typically cervical or thoracic spine. A systematic examination procedure will help identifying the source of the symptoms, and aid an appropriate management approach. If you have any questions regarding suspicious arm pain and need and assessment, please give us a call at (02) 8411 2050. At Thornleigh Performance Physiotherapy, we can give you an accurate diagnosis and treatment, to help you get back in action as soon as possible. We are conveniently located near Beecroft, Cherrybrook, Hornsby, Normanhurst, Pennant Hills, Waitara, Wahroonga, Westleigh, West Pennant Hills, and West Pymble. A 47-year-old male presents with an acute left knee injury from rotational standing up movement from a seated position at lunch. He felt immediate pain in the medial side of his knee and reports a locking sensation when attempting to straighten his knee. What can physiotherapy do to help. The patient was unable to weight bear on his left leg as he could not straighten his left knee due to pain and catching sensation. During passive range of motion movements, his knee could be flexed to full range, however was painful at end of range and when moving leg back into extension. Passive patella movement did not reproduce his symptoms, though symptoms reproduced upon palpation of medial border of knee cap and medial knee joint. No swelling was evident at time of review, however this is expected in the acuteness of his injury. His mechanism of injury and clinical presentation indicate an acute torn flap of his medical meniscus. Small meniscal tears can be managed conservatively if a person’s range of motion is not greatly affected, have minimal swelling and are able weight bear. The first phase of conservative management of an acute meniscal tear includes maintaining knee extension range of motion and providing stability to the knee to reduce any risk of further injury. Small amplitudes of passive accessory movements were undertaken in attempt to normalise joint range of motion. He was provided with education regarding the importance in maintaining knee extension and encouraged to undertake light knee extension stretching techniques to aid in this. Kinesiology tape was used to strap his knee to promote healing, support, reduce swelling and assist in pain reduction. The patient responded well with dry needling to his hamstrings and calf muscles which assisted in off-loading the knee joint from muscle tightness. Following the initial treatment, the patient had a reduction in pain symptoms and ability to weight bear as tolerated through left leg. Over the next two to three weeks, the focus was to eliminate swelling and achieve full range of motion and focus on hamstring and quadriceps strength. Through the completing all home strengthening and stretching exercise program, this patient improved well and could obtain full range of knee extension with a reduction of pain and an increase of muscle strength. He was provided with full range squats and lunges as a progression to his hamstring and quadriceps strengthening exercises with added endurance training program for his hip external rotators. After another few weeks, he could return to his home-based fitness program and work schedule without any issues. If you have any questions regarding your knees or are interested in seeing if we can help you, please give us a call at (02) 8411 2050. Here at Thornleigh Performance Physiotherapy, we can give you an accurate diagnosis and treatment, to help you get back in action as soon as possible. We are conveniently located near Beecroft, Cherrybrook, Hornsby, Normanhurst, Pennant Hills, Waitara, Wahroonga, Westleigh, West Pennant Hills, and West Pymble.